1. You haven’t yet installed your gateway or you can’t find your gateway prior to testing. If you did not install the gateway before reaching the File System step (where you need to choose your gateway), you may need to close the browser and log in again. If you did install the gateway but it isn’t showing up as an option, close the browser and log back in. If this still doesn’t work, you may need to go back to On-Premises Gateway and in the Service Setting Tab, click Restart. 2. You want to use a new server or change your credentials. When you want to use a new server, you will have to create a new connection and make sure that the connection is updated throughout all file system actions (i.e. “List files in folder’ and ‘Get file content using path’), the actions with a green background. Press ‘…’ and set the new connection. When you want to change your credentials, you must go to Connections and edit your user name and password. 3. 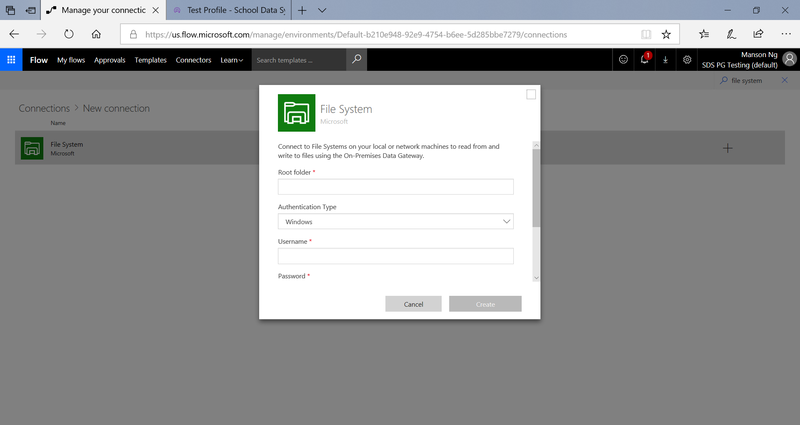 Flow ran successfully, but the status of profile on the SDS user interface did not change. Ensure that before you test the connection, you open the SDS user interface and set the profile to “paused”. Then, you will be able to see user interface change states a few minutes after you have successfully connected. Wait a few minutes. There is a delay in the updating of the status due to caching. 4. 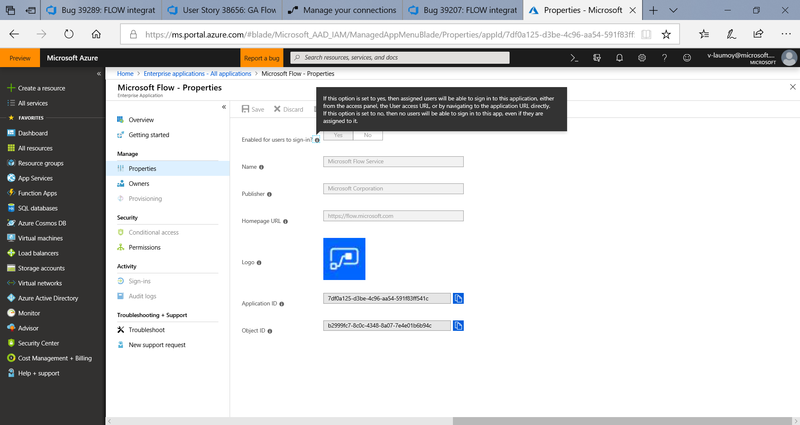 When you try to log into Flow, you receive a message that says “Authentication Failed” and the error is AADSTS50001: Resource 'https://service.flow.microsoft.com/' is disabled. b. Click on the Azure Active Directory icon in the menu on the left. c. Then click on Enterprise Applications. d. In the Application Type, select All applications. e. Then type Microsoft Flow in the search box.